No matter how old we got, Joe was always a big brother to me. He always looked out for me, and over the years we had a lot of great times together. I learned a lot from him and I’m a better person because of him. I’ll miss having him to turn to when I need a big brother around to reassure me. Proud of all the things he was able to achieve, proud to call him my big brother. Years ago, Joe showed me around Manhattan and I learned to love the city. He made me fly alone for the first time to meet him in Las Vegas and I learned to love traveling. He came with me to a Stevie Nicks concert when no one else wanted to go. He took me to see bands in Philadelphia and I learned to love local music. But mostly, Joe encouraged me to have confidence in myself and to push myself in my career – which I’m still working on………..
Those are just a few examples of how he always wanted me to experience the best of life. Can’t believe the year is almost over -Â the last entry I posted was to recap the 1/2 marathon in June and now the Twin Cities 10-miler has come and gone. I did very well in the 10-mileÂ this year despite the rainy weather, so I’m looking forward to the next race in the spring of ’09 when I can do another 1/2 marathon. It helps to have the great trails in Elm Creek park so close to the house to do my training runs. Thanskgiving was great as usual,Â now we’re ready for Christmas, and then my favorite time of year – snowboarding season! It’s All About Me, Damn It! 20 July 2008 / Kevin / Comments Off on It’s All About Me, Damn It! Thanks Stevie for taking the time to come and visit this weekend for my birthday.Â It was great to see you and to just hang out for a while.Â I can’t believe you’re headed back to France soon.Â I know you’re looking forward to being home.Â Please keep in touch! The 1/2 marathon wet well despite the tough course — Lots of bridges to crosss back and forth over the Mississippi and a lot of steep hills. My finish time wasn’t too shabby, but next year will be better. 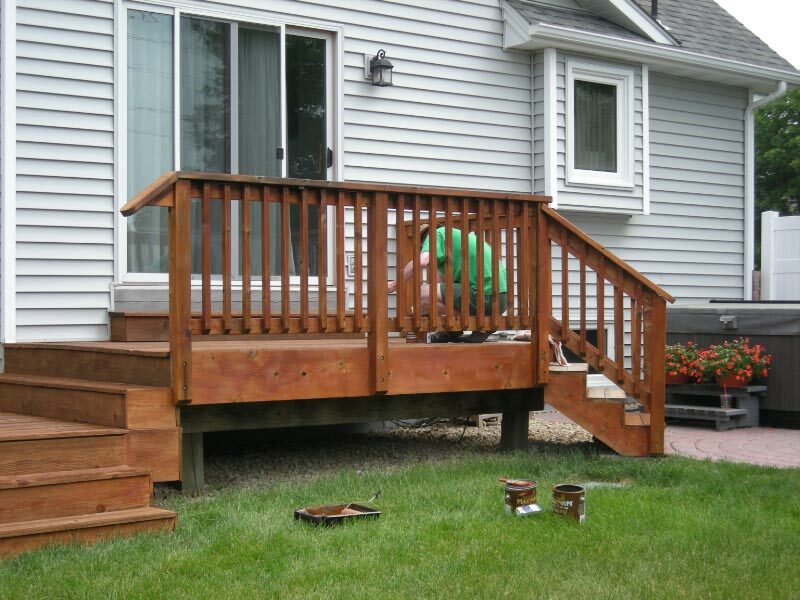 Otherwise, we FINALLY got around to staining the deck – I’m sure the neighbors are thrilled.Â It looks great – we’ll see how long a 5-yr deck stain lasts in MN. 17 May 2006 / Kevin / Comments Off on Where has the time gone? I can’t believe it’s the middle of May!Â Yesterday I had my 12th anniversary working for Navitaire (and all it’s former names).Â It was fairly uneventful in and of itself, although at the end of the month when the anniversary email comes out, I’ll get a few “wows” from co-workers! Lately it’s been hard to know whether I’m coming or going.Â I’m in SLC now, and the weather is strangely hot!Â Temps in the 90’s during the day…but beautiful morning and evenings.Â Still, it may be a little early for these temps! Welcome to our new “blog-style” site! 4 April 2006 / Kevin / Comments Off on Welcome to our new “blog-style” site! Since I’m traveling so much, it’s hard to use traditional tools to keep a web site up to date.Â So I went looking for a site setup that was better suited to personal web sites for the purpose of posting news and information for those who would like to read it. Well, it turns out that it pretty much was a blog is.Â For those that don’t know, it’s short for “web log”, or online journal.Â One of the nicest things about it is that it will allow both Jeff and I (and maybe even you!) to put content on the site more easily.Â We’ll see if more easily equates to more often! Please feel free to read and comment on the posts!Â We’ll try to put them into categories so it may make it easier to select specific ones.Â And of course, let us know what you think!